Much has changed for digital marketers over the past few years: The rise of social. The shifts in paid search. The emergence of mobile. Of all the changes, in their complexity and newfound opportunities, none are more confounding than programmatic media buying. Programmatic media buying is the concept of creating automation and efficiency around what used to be a heavily human-intervened process of buying and selling media. Programmatic media equates to access to media in real-time, on the fly iterative optimization of media activities such as creative and messaging, precision audience targeting, and elimination of the labor intensive insertion order processes. 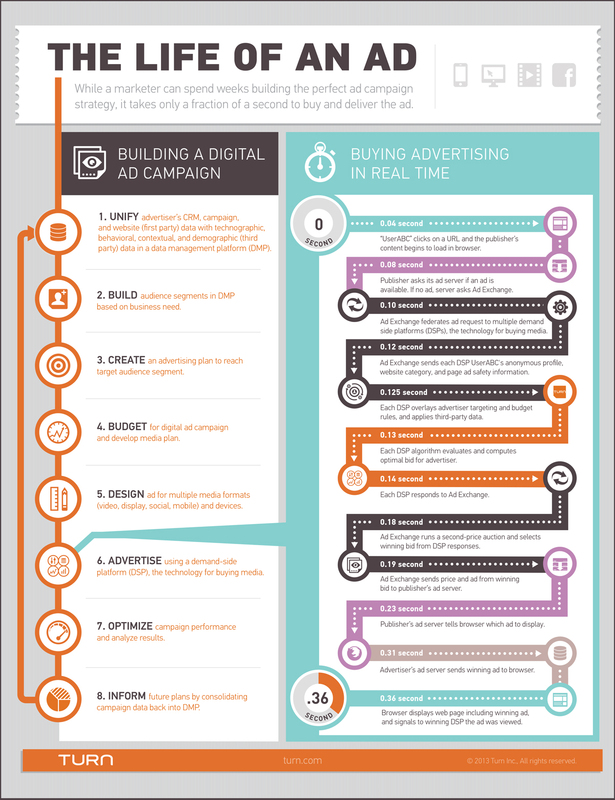 To put this in context, there is a great infographic published by Adweek that shows all of the steps that take place in about 1/3 of a second to determine which online display ad fires at any given time. I had the pleasure of sitting on a panel on programmatic buying for DFWIMA (Dallas/Fort Worth Interactive Marketing Association) and there were some themes that came up multiple times in the discussion. Transparency was the clear leader, with upwards of 30 mentions. Goals and objectives were in second place. Then, the theme of creating a competitive advantage rounded out the key takeaways. These themes lend themselves well to what we at PMG feel are the 3 things that an advertiser should care about in programmatic buying. Advertisers should be grading their programmatic partners against these standards, whether those partners are technology providers, agencies, or their in-house team. Get your pencils ready to grade. And away we go! Media Cost: Are you receiving true media cost so you can identify the relationship between media cost and efficiency? If there are additional fees layered into the media cost, you not only miss out on this keen intelligence, but you’re also letting your provider take free reign on how your media dollars are spent…even if that does not include media but funding their bottom line. Technology Cost: Do you know the true cost of the technology in use so you can determine if the technology investment is paying off, relative to another solution? Service Cost: How are you compensating your partner for the services. These days, there is tremendous overhead at some of the holding company trading desks. 612 employees at Xaxis. 149 employees at Cadreon. 123 employees at Accuen. That kind of headcount doesn’t come cheap. So if you don’t see the service fee on your invoice, you may want to find out. It has to come from somewhere and hopefully not from your presumed media budget. Audience: Are you receiving a clear line of sight on which audiences are most responsive to your ads? Are you aware of the costs of targeting this audience using 3rd party audience providers like BlueKai, Exelate, and Datalogix? Use of 1st party data: Is your partner leveraging your proprietary data, or are they simply living off of their macro best practices and algorithms which could equate to media waste and opportunity lost? Fraud and Viewability: Are you receiving visibility into whether the impressions you are buying are truly impressions and not bots or out-of-sight ads? Frequency of optimization: Is your partner performing optimizations on a daily basis and are those optimizations relevant? There is a fine line here as it is easy to “overdo it” and optimize before you have any insight. Addressing the unique challenges: We believe that 50% of an advertiser’s challenges are shared by those in their industry (such as the Amazon effect on all retailers). The other 50% are unique to each advertiser, such as a retailer’s store density and the effect on digital media on a locality basis. Another example is the supply for a travel provider and the missed opportunities of an incomplete supply chain. How well is your partner bringing unique strategies and tactics to the table to address your needs? Proprietary Value: Some may view proprietary and secret as the same. At PMG, we believe in transparency and that includes our advanced techniques such as quantitative activities, optimization techniques, and big data practices. These create value and we love to share the why and the how. Why? Because these activities create advertiser confidence and with confidence comes a greater appetite for breaking down boundaries and trying new things. That adventurous mindset creates long term and sustainable success. We don’t worry about giving away what some would call our secret sauce. The beauty of ideas is that they don’t run out.